Specialty lubricant provider Klüber Lubrication and perma-tec, a producer of single point automatic lubricators, have launched a new product line designed to provide customers in the marine industry with a cost effective and reliable solution for onboard equipment maintenance. The product line carries the brand name “Klübermatic” and represents a unique approach to improving marine operations. The new, collaborative effort combines specialty lubricants for a variety of applications the hardware for single point automatic lubrication of all manners of deck and machinery equipment. Together, the partnership provides vessel owners with the opportunity to install an automatic lubrication system which combines the best lubricant for the application with an innovative single point automatic applicator; backed and supported by the engineering services of both companies. The Klübermatic is a self- generated, fully automatic delivery system for Klüber lubricants to single or multiple lubrication points. Depending on the size of the applicator and the lubrication requirements, the Klübermatic delivery system can be set to discharge the correct level of grease or oil for up to 24 months. The Klübermatic line includes both electro-chemical and electro-mechanical drive systems. Each Klübermatic consists of the drive system, piston, and lubrication canister filled with correct lubricant for the specific application. A complete line of accessories that may be required to complete the installation are also available for additional purchase. Depending on the model, the Klübermatic will contain between 30 and 500cc of lubricating grease or oil. The discharge period for the Klübermatic is determined by the movement of the internal piston. By controlling the pressure on the piston in the electro-chemical units or the lubrication intervals in the electro-mechanical units, the proper amount of lubricant will be delivered over the discharge period. The device can be directly mounted to the grease fitting or it can be remotely mounted using brackets and tubing. At the end of the discharge period, depending on the type of drive used the complete unit is removed, disposed of and replaced with a new unit (electro-chemical) or the lubrication canister and batteries are replaced and the drive unit is reused (electro-mechanical). When using traditional and/or manual methods, over 50 percent of machinery failures can be attributed to insufficient lubricant application, improper lubricant for the application, or lubricant that has aged and no longer protects the machine element. Switching to the Klübermatic program can significantly reduce these failures and deliver real benefits to the operator. Reliably delivering the correct amount of lubricant at the correct interval over the lifetime of the applicator eliminates manual lubrication routines, which on some cases, can over-lubricate when the lubricant is being applied and under-lubricate if the lubrication intervals are too long or missed. This can lead to seal failures and excessive friction during periods of over lubrication and excessive wear rates and corrosion during periods of under lubrication. Klübermatics enhance best practice preventative maintenance routines while also eliminating much of the hassle of planning and scheduling manual applications. With the Klübermatic system, labor savings and improvements in crew safety can also be realized. Man-hours required to maintain equipment are reduced as each lubrication point only needs to be accessed at the time the Klübermatic is exchanged or during routine inspections. With the reduction in manual lubrication, also comes a reduction in the risk associated with accessing lubrication points that are in confined spaces, hard to reach locations, or exposed areas of the vessel. Correct installation and lubricant choice are essential for maximizing the benefits of the Klübermatic system. Each Klübermatic installation begins with a vessel survey by the Klüber and perma-tec engineering team and continues with installation support and periodic operational reviews. During the survey, the team will identify the opportunities for automatic lubricators, the installation design, and the lubrication requirements. In the engine room, lubrication points on main and auxiliary mechanical systems that can be fitted with Klübermatics include lube oil transfer pumps, air compressors, feed water pumps, engine cooling pumps, waste treatment systems, air supply fans, hydraulic motors for controllable pitch propellers, portable water pumps, and fire suppression systems. On deck applications for the Klübermatic largely depend on the purpose of the vessel and the equipment included. Lubrication points on deck cranes, winches, capstans and fairleads can benefit from reliable, routine lubrication. 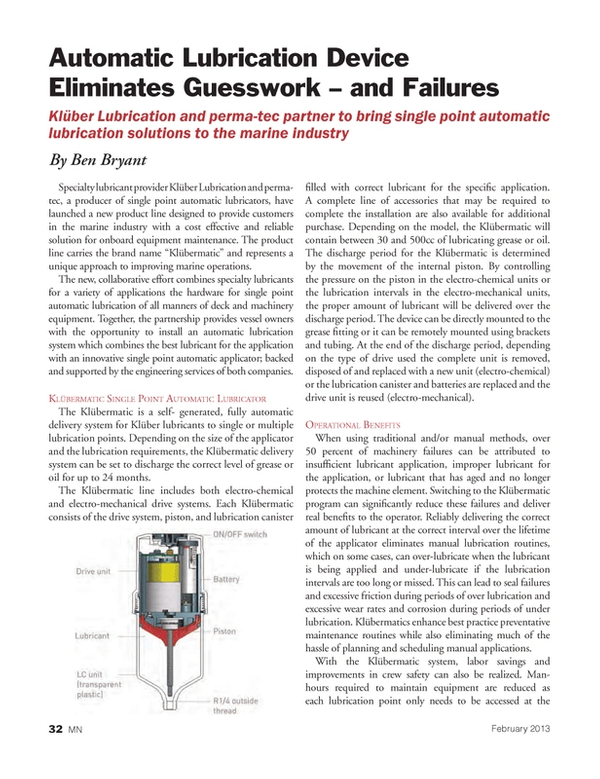 Where lubrication is a regulatory requirement, the use of Klübermatics will help ensure the vessel remains in compliance. An example is the USGC requirement to lubricate lifeboat davits on a monthly basis. A survey of the vessel by the Klüber and perma-tec team will identify the applications where Klübermatics can benefit your operation. Klüber and perma-tec installation and after sales support will ensure the systems function as designed. The unique features of the Klübermatic program include controlled and metered delivery of the correct lubricant, automatic lubrication systems engineered to meet the specific requirements of the application, and the combined installation and after sales support by the combined engineering team. Klübermatics provide the operator with peace of mind that deck machinery and winches will not fail during critical operations such as docking, cargo handling, maneuvering in restricted channels, or at sea during inclement weather because of improper lubrication.